Updates have been infrequent recently so today we’ll feature a relatively large number of articles. These are five short pieces looking towards the new year as 1921 has just begun and the aftereffects of the Great War are still on everybody’s mind. From that dramatic day of November 11, 1918, marking the end of the great World War, until the present hour, the perspective of the world’s future has been greatly clouded. True perspective on the great events of the past year in regard to the possibility of a more peaceful and settled world during the present year may scatter somewhat that haze which hangs so ominously over the tangled condition of international affairs. The general trend of people, individually, nationally and internationally, since the conclusion of hostilities has been toward conservation and communism. But there are conditions that predict international unrest, turmoil, and, mayhap, disaster, to a greater or lesser degree before this old world settles down to a lasting and abiding peace. Across Armenia’s prostrate body the Russians have joined hands with the Turkish nationalists and stand ready to send an army against the Japanese in Siberia. At the same time they retain strength enough to face their crisis with England. France undertook the formation of a Catholic block in central Europe. It envolved an entente of Poland, Hungary, Austria, France, Belgium and the Catholic states of south Germany. Part of the plan was the restoration of kings in Austria, Hungary and Bavaria. To meet this movement the “little entente” was formed. It included Rumania, Jugo-Slavia and Czecho-Slovakia. All these states would be endangered by the return of the Hapsburgs to power. To this little entente Italy has added herself. At the Geneva conference the smaller nations appeared as a block against the power of the larger nations to govern and control them. In this they forwarded the policy of the Monroe doctrine and of America. Whatever America’s internationalism it will never sanction the aggrandizement of smaller nations by the more powerful. Closer union of Latin-American nations, under the leadership of King Alfonso of Spain, has challenged this policy. Our answer is yet to be stated in definite and concrete terms. The return of Constantine to Greece, the weakening of Japan by internal revolution,s and the subsequent strengthening of China, the climax yet to come between Britain and Russia and the straining tension between Japan and England and England and Ireland, all these mark an era of trial and possible conflict, which may be settled in two years, or possibly not in five. The year of 1921, at the present outlook, appears negligible as a factor in the world’s peace. Tax reform and new methods of raising revenue will be the first problems tackled by the various state legislatures, now about to convene. Next comes the problems of abolition of needless state departments, with questions of public improvement, utility corporations and public welfare ranging close behind. 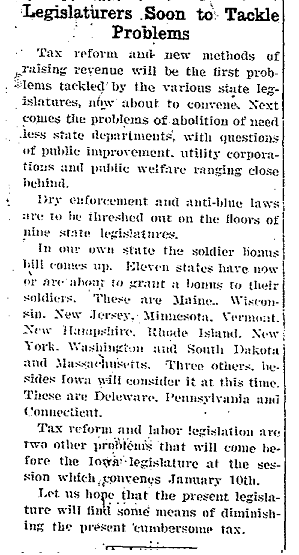 Dry enforcement and anti-blue laws are to be threshed out on the floors of nine state legislatures. In our own state the soldier bonus bill comes up. Eleven states have now or are about to grant a bonus to their soldiers. These are Maine, Wisconsin, New Jersey, Minnesota, Vermont, New Hampshire, Rhode Island, New York, Washington and South Dakota and Massachusetts. Three others, besides Iowa will consider it at this time. These are Delaware, Pennsylvania and Connecticut. Tax reform and labor legislation are two other problems that will come before the Iowa legislature at the session which convenes January 10th. Let us hope that the present legislature will find some means of diminishing the present cumbersome tax. It is an old saying that every dog has his day and this seems to be true of this year of 1921. 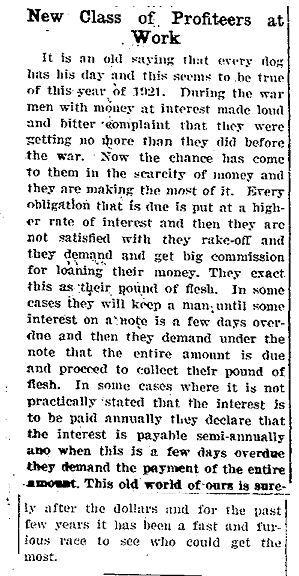 During the war men with money at interest made loud and bitter complaint that they were getting no more than they did before the war. Now the change has come to them in the scarcity of money and they are making the most of it. Every obligation that is due is put at a higher rate of interest and then [whatever] they are not satisfied with they rake-off and they demand and get big commission for loaning their money. They exact this as their pound of flesh. In some cases they will keep a man until some interest on a note is a few days overdue and then they demand under the note that the entire amount is due and proceed to collect their pound of flesh. In some cases where it is not practically stated that the interest is to be paid annually they declare that the interest is payable semi-annually and when this is a few days overdue they demand the payment of the entire amount. This old world of ours is surely after the dollars and for the past few yeas it has been a fast and furious race to see who could get the most. While we are looking upon England with a feeling of resentment for what she is doing in Ireland, it would be well if we cast our eyes toward the Philippine Island and see what the people there think of our management of the Brown Brothers. It is said that there was recently and uprising in the Philippine Island against the United States power, and that several lives were lost on both sides. The people demand the right of self determination and want their independence. It seems that it would be well for the Philippines to have their independence. Not that we believe that it would ever result in anything but disaster to the Islands, but that it would be getting rid of something that we do not want and something that never do us any good. In relinquishing the oars of the ship of state to the Philippines it will be well for Uncle Sam to get clear out of the boat. We do not care to ride while others guide. Let the brown brother go and when Japan gobbles him up it will be no affair of ours. — Humboldt Republican. The trouble in the Philippines is to let go. America has put millions there and will never get a cent out. We doubt very much if many people in the Philippines really want this country to let go. The politicians here and there have started a talk in independence just because they wanted a job. The people of the Philippines will be far worse off out from under the care of this nation than they are under it. Freedom, to them, will mean to have them burdened with heavy taxation and a very few politicians reap the benefits. What they term their freedom is like the cry of the Children of Isreal (sic) for a kind. It may be that will be the end of the matter. If this nation pulls out from the Philippines it should shake the dust of the Island from off its feet and let the little brown fellows paddle their own canoe. Haughty pride and asinine obstinacy often makes ambiguous fools of us all. For more than four years ENgland sent her young men, and especially the young men of her principal provinces, viz, Canada, Ireland and Australia, to battle with the Hun to the death. And to what purpose? To avenge Belgium? To thresh the “uber alles” idea out of Kaiser Wilhelm’s head? To demonstrate that liberty and justice are the foundations of brotherly love and peace between nations, or to preserve peace by whipping the creator of war? At that time we would have answered yes. But now — now when the war is over, now when tiny new nations are created from the lions of the old and are given liberty and self government, now when the men who fought England’s own battles for her return to their homes — what about England’s policy? Is she demonstrating her good faith to the sons of “Old Erin?” Here is a nation, intelligent, capable of self government and self-determination, and she is denied the privilege she earned, by her very life blood, for the new born nation of Poland, Rumania, Jugo-Slavia and Czecho Slavokia (sic) — the right of self government. While England has sought with greedy fingers to add 10,000,000 square miles to her domain she has denied common justice and equality to a nation that furnishes more than her share of the world’s statesmen.